From the gritty streets of Bern, Switzerland, comes the raw and primitive recordings of The Monsters. Fronted by Beat Zeller, aka Reverend Beat Man—owner of Voodoo Rhythm Records—the band formed in 1986 and made a name for themselves as a wild garage rock–meets–rockabilly outfit. They toured Europe and presented themselves as a force to be reckoned with. 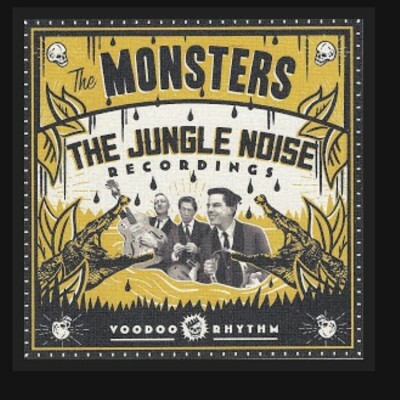 The Jungle Noise Recordings was originally recorded in 1994 and was the first album that saw The Monsters use an electric bass rather than an upright. The album was recorded at home instead of a studio so that the record could better boast the raw elements of The Monsters’ sound. It was originally released as 10” record via the underground German label Jungle Noise. After The Jungle Noise Recordings came out, The Monsters conducted a lengthy tour that saw them established in the Europe’s rock n’ roll scene. Giving this compilation a thorough listen some 20ish years later, I can see why.